My friend Jenn was obsessed. She'd been chatting with a Canadian colleague and was consumed by tales of Canada's pub fare extraordinaire - Poutine - a mound of crisp French Fries, topped with fresh cheese curds and drenched in rich brown gravy. She HAD to have some. Unfortunately, however, a plane ticket to Montreal was out of the question. Instead, she asked me and our mutual friend Carrie to join her at the one and only Canuck hot spot in New York City - the Inn at Little West 12th Street. Jenn rhapsodized about our upcoming Poutine pig-out for a week. Now Carrie and I were officially obsessed as well. But when our Meatpacking District meet up finally happened last night, we were officially disappointed. It seems that the Inn hadn't attracted the in-crowd and had stopped serving its Northern clime menu several months ago. The only thing to do was high-tail it over to El Faro and drown our sorrows in Tempranillo and Shrimp in Green Sauce. That said, we haven't given up on the dream that is Poutine. In fact, Carrie and I have booked a quick trip to Toronto in the coming weeks. If necessary, we'll resort to sneaking some back in to the U.S. of A. for Miss Jenn. 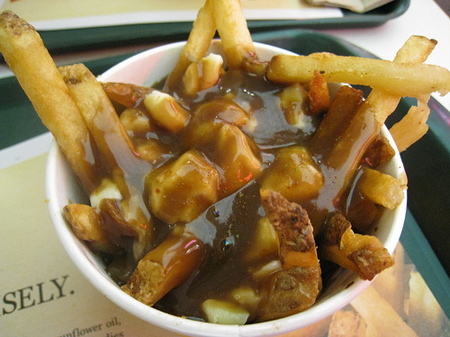 But, if anyone out there knows of a place to taste Poutine in the five boroughs, please share! Pommes Frites on 2nd & St. Marks offers poutine on the menu. Not as awesome as the Canadian version, but tasty nonetheless.